More crazy cool book covers! Do you notice that sometimes when you read classical literature, all the characters do between breaks in the conversation is smoke? Must be hard for reformed smokers, feeling the pull of the literary giants, glamorizing a habit we know condone. However, there is now a smoke free way to get your kick. Tank Magazine, located in London, England, has created super-cool book covers at Tank Books for some seriously super-cool authors. These book covers are meant to mimic cigarette cases and are being dubbed the most successful book packaging design in years. 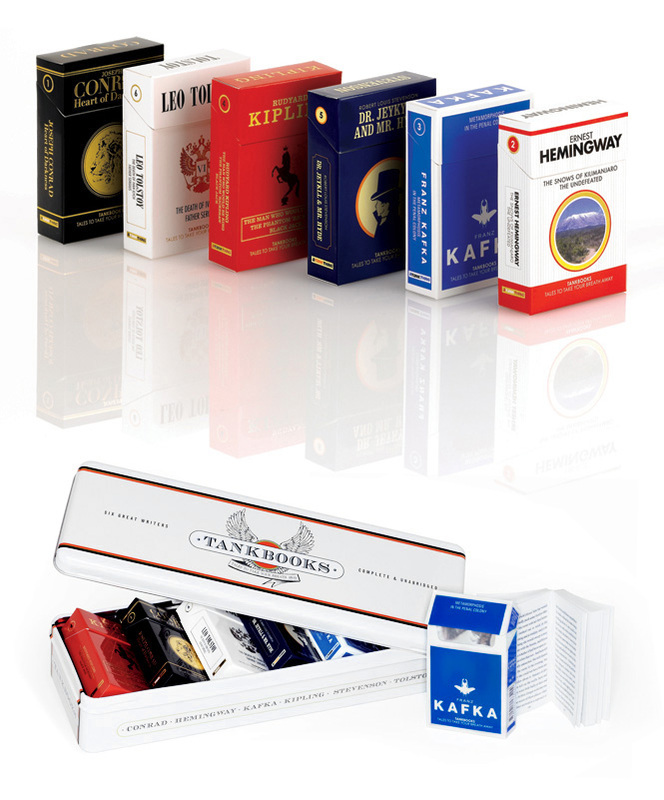 Check out the list below for titles available in these cigarette boxes. You can see they were aptly chosen, because we can all envision them puffing away while they write page after page. * Where to find them in Canada: Tank Magazine is British and therefore the price is in pounds. I sent the company an email to find out what costs would be to order these books and this is the reply I received. Click here to order the books from there website. Unfortunately these books are not currently available in stores. Posted on February 8, 2010 February 8, 2010 by LN	This entry was posted in Book covers, ernest hemingway, franz kafka, jospeh conrad, Leo Tolstoy, Robert Louis Stevenson, rudyard kipling. Bookmark the permalink.